What is the Aroma Freedom Technique (AFT)? AFT is a simple but effective technique for using your Young Living’s essential oils, combined with intention and awareness, to breakthrough and transform the negative thoughts, feelings, emotions and memories that may be holding you back. Dr. Perkus, the creator of AFT, has taught internationally on trauma release, brain wellness, and personal fulfillment using essential oils. The Aroma Freedom Technique (AFT) uses the power of aromatherapy to release blocks that hold you back from manifesting your heart’s desires. What does the Aroma Freedom Technique (AFT) do? It uses a combination of traditional/familiar and accepted psychotherapeutic approaches with aromatherapy as a means of interrupting negative thought/emotional patterns. The Aroma Freedom Technique quickly and easily releases you from your negative thoughts, feelings, emotions and memories that are holding you back and preventing you from achieving your goals, dreams and desires. The Aroma Freedom Technique is a way to quickly identify and let go of thoughts and feelings that are not in alignment with our heartfelt intentions. How does the Aroma Freedom Technique (AFT) work? 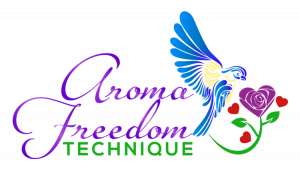 Using a blend of aromatherapy and coaching, the Aroma Freedom Technique releases emotional blocks that prevent you from manifesting your heart's desires and achieving your dreams. How can the Aroma Freedom Technique (AFT)help me? The Aroma Freedom Technique (AFT) is designed to help you be your best self. A session can be done 1 on 1 or in a small group setting either in person or via an online meeting such as Zoom. If your session is not in person we have to ensure you have the correct Young Living essential oils on hand. AFT is not a replacement for traditional/familiar psychotherapy and no diagnoses are made or treated during sessions. Please consult your physician or therapists to discuss any changes to your current therapeutic routine.